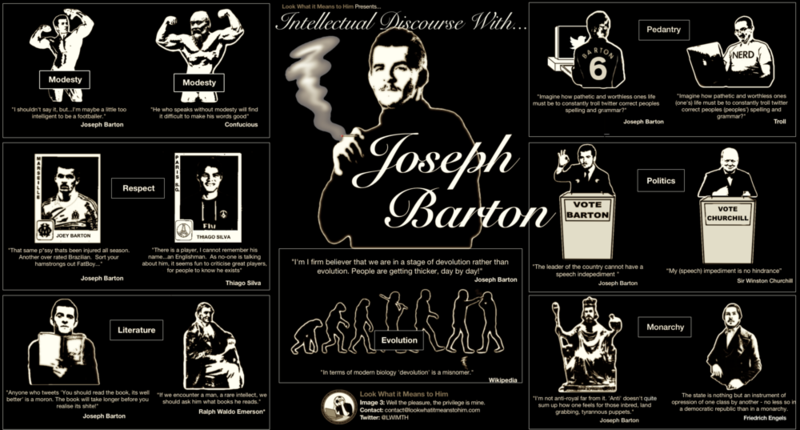 Ah, Joey Barton. The man-who-thinks-he's-a-thinking-man's thinking man. He'd been out of our lives for a while but young Joseph's appointment as Fleetwood manager has dragged him, kicking and punching, back into our lives. To celebrate his return, I've opportunistically published an infographic that cherry-picks some of Joey's choicer public statements and compares them to quotes from more intelligent and / or nicer people. It's not big and it's not clever, but ... yeah, you get where I'm going here.